Round Hill Outdoors is excited to announce the first ever Round Hill Appalachian Trial Festival, set for June 15, 2019 at B Chord Brewing! You can both celebrate the natural beauty of the A.T. and learn about protecting it. We’ll have partner organizations (Appalachian Trail Conservancy, Potomac Appalachian Trail Club, Loudoun Wildlife Conservancy, Friends of the Blue Ridge, Virginia Master Naturalists) with displays and talks about hiking, trail conservancy and more. Enjoy live music, too—plus equipment demos, kids activities, food and, of course, beer. Following 2,100 miles of mountain ridge lines, the Appalachian National Scenic Trail (A.T.) crosses 14 states, from Maine to Georgia. It’s the longest and oldest marked footpath in the country. And we’re lucky enough to have the A.T. right in our backyard. In the shadow of the Blue Ridge Mountains, the town of Round Hill sits between two beloved A.T. centers, Bears Den to the south and Blackburn to the north. So, when town leaders learned about the Appalachian Trail Community program, it seemed a natural fit. After more than a year of work and planning, this festival acknowledges Round Hill’s official designation as an A.T. Community, recognizing the Trail as a community assist and pledging to support ongoing Trail stewardship. 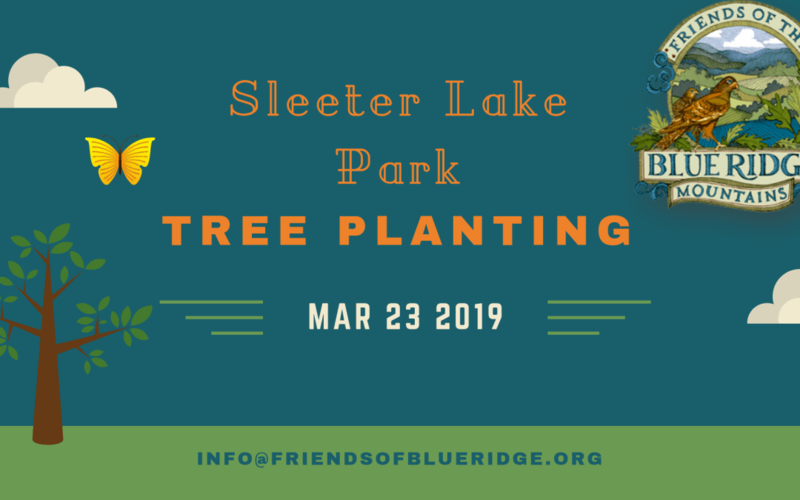 An announcement from Friends of the Blue Ridge Mountains, a fantastic local nonprofit organization that selected Sleeter Lake Park for a special project to further extended the vision of making the park a sanctuary for all of us. Feel free to share this post or their flyer. Thanks to donations from our members, Friends is sponsoring a collaborative project to enhance Sleeter Lake Park, western Loudoun County’s newest recreational park in Round Hill. Our partners include Loudoun Wildlife Conservancy (LWC), Loudoun County Master Gardeners Association (LCMGA), and the Town of Round Hill. Friends is providing an environmentally friendly master plan for the park based on a design by James Remuzzi of Sustainable Solutions. Meadows Farms Nurseries also donated 20 trees for the project. LWC is developing a pollinator meadow with native plants and shrubs. LCMGA has identified existing mature trees along paths through the woods and assisted in the selection of indigenous trees to plant along the paths that connect existing and future park amenities. The paths will employ earth stabilization and best management practices by incorporating erosion control and water retention/filtration methods on the slopes leading to the lake. Other improvements planned for Sleeter Lake Park include an outdoor classroom for teaching environmental stewardship, a viewing platform, pollinator gardens and meadow, picnic areas, benches, rest rooms, and fishing pads along the lake. Round Hill Outdoors and the Round Hill Arts Center received 45 works in a variety of media from artists of all ages for the 2nd Annual Appalachian Trail Art Show. These works will be on display at the Round Hill Arts Center throughout the month of March. The purpose of the show is to broaden public awareness and appreciation of the Appalachian Trail and the beautiful wild nature of the Blue Ridge. 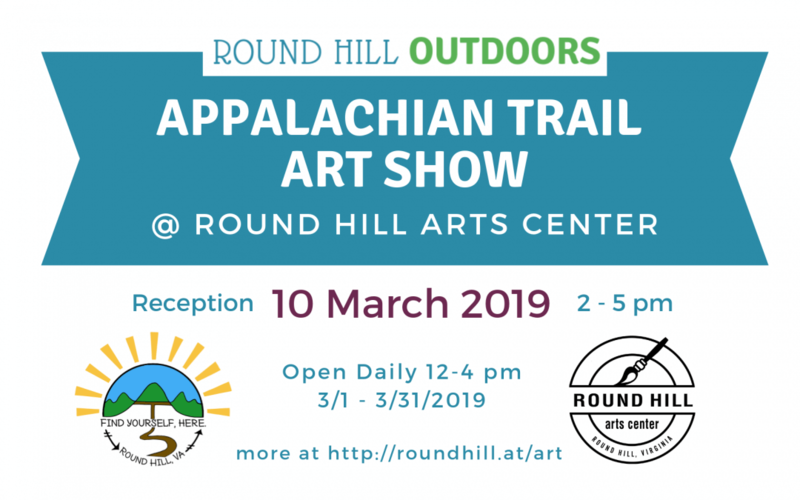 There will be a reception at the Round Hill Arts Center on March 10 from 2-5pm to recognize the participating artists to celebrate Round Hill’s new status as a designated “Appalachian Trail Community”. The Round Hill Arts Center is located at 35246 Harry Byrd Hwy #170, Round Hill, VA 20141. Judges Jill Evans-Kavaldjian and Brian Kirk will present prizes to the winners at 2:30pm. Prizes for the two student categories (grades K-6, and grades 7-12) were generously provided by Mod Pizza, the Round Hill Arts Center and Sweet Rose Bakery. Adult winners will receive gift certificates donated by Magnolia’s at the Mill, West End Wine Bar & Pub, B Chord Brewing Company and Otium Cellars. Awards will be presented at 2:30pm. At 2:45pm, we will introduce our guest speaker, Sandi Marra, Chair of the Appalachian Trail Conservancy Board of Directors. Refreshments will be provided by Savoir Fare Catering and Notaviva Vineyards. There will be snacks and arts activities for the children. For more information, visit our Art Show page or contact Susan Stowe. It was spring 2018, and the tiny town of Round Hill in the Blue Ridge Mountains of Virginia was gearing up for Screen-Free Week. A small town that’s more than 100 years old, Round Hill is home to many communities and neighborhoods, all built at different times: some Round Hill homes are over 100 years old, some were built in the 60s, some in the 90s, and clusters of new neighborhoods were added recently. All it took for us to organize a Screen-Free Week event was one fearless parent, a few committed town citizens, an open-minded elementary school principal, and a fantastic town planner. These amazing people pulled off a campaign to trade screen life for real life for an entire week. We posted signs advertising our town-wide Screen-Free Week around town, and we used the town’s and community’s social media for screen-free advocacy and encouragement. But the most important and challenging part of it all was getting the youngest generation, our children, to give up screens for more meaningful ways to spend time with family, ideally outdoors. Students would bring home a flyer from school on the first day of Screen-Free Week listing 100 fun screen-free activities to do as a family. Students would be allowed to complete their homework without screens during Screen-Free Week. Upon the successful completion of Screen-Free Week, students would enjoy an outdoors nature-oriented scavenger hunt at school. With these details in place, the very first Round Hill Screen-Free Week began, and succeeded in bringing kids and families out of their homes and into the outdoors. It went great, but it was not perfect. Some parents and kids still had screens and some teachers still assigned screen homework (just for one day). 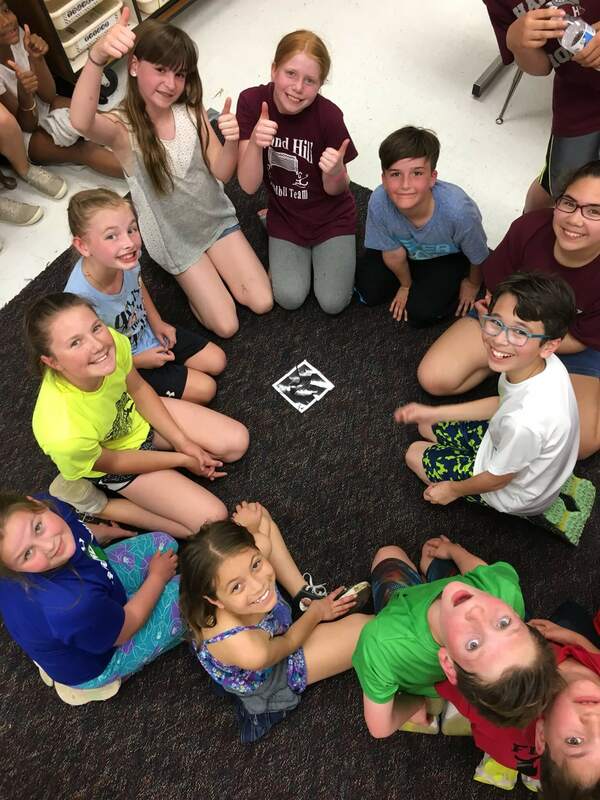 But the amount of fun our Round Hill families had was well worth all the effort: parents, kids, and neighbors really connected through hikes, playing games, or hanging outdoors and soaking up the sun. Sean Lloyd, a resident of Round Hill, organized a community hike at the nearby Appalachian Trail, a national treasure, which some Round Hill residents had yet to discover. 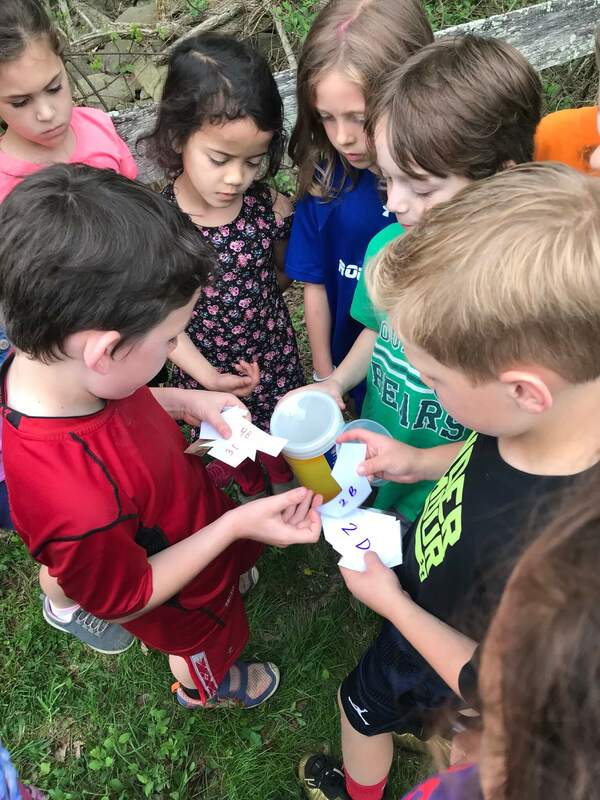 Melissa Hynes, Round Hill’s town planner, found funding to purchase some native plants for Round Hill Town Park that would attract native wildlife and provide educational opportunities for kids. She organized a town-wide event where residents planted a pollinator garden with help from local scout troops. 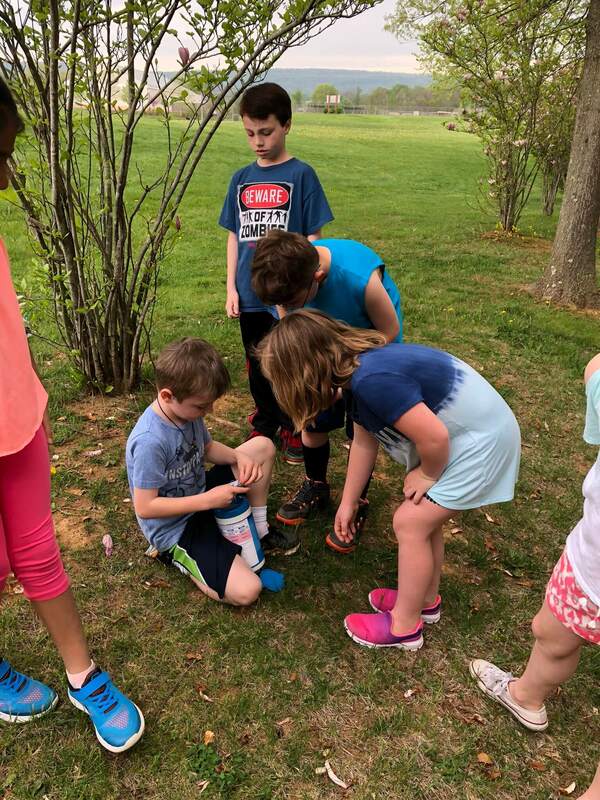 And the students had a grand school scavenger hunt outdoors on Friday, with every grade taking a turn while two parent volunteers reshuffled and re-positioned the scavenger hunt items for the next group of students. Round Hill’s Screen-Free Week proved how great it feels to celebrate life away from screens and in the great outdoors. Screen-Free Week is a great way for a community to organize a variety of different outdoor events that bring families and neighbors together. As we learned, it can and should be done if we want to pass on to our children the value of reality, the value of neighbors, friends, and togetherness, and the value of real life experience without the distraction of a screen. The Round Hill Appalachian Trail Committee and the Round Hill Arts Center invite artists to participate in a new art show entitled “The Appalachian Trail: Art of the Adventure”. The purpose of the show is to broaden public awareness and appreciation of the Appalachian Trail. Artists are welcome to submit their choice of artistic expression, including paintings, drawing, photography, fiber arts, stained glass, and sculpture. There is a separate category that welcomes submissions from young artists in grades K-12. The Appalachian National Scenic Trail was completed on August 14, 1937. This 2,189-mile trail crosses 14 states and hosts an estimated 3 million visitors a year. This call to artists to participate in this exhibit is to celebrate the 80th Anniversary of the completion of the Appalachian National Scenic Trail. The finished work can hang on the wall or from the ceiling, or sit on a pedestal or the floor. Works will be judged by a group of Appalachian Trail and Art Enthusiasts carefully selected by the Round Hill Appalachian Trail Committee and the Round Hill Arts Center. Judges will be looking for artwork that features a combination of artistic skill and thoughtful representation of the Appalachian Trail. Students are also encouraged to enter for free! “The Appalachian Trail: Art of the Adventure” will be on display at Round Hill Arts Center from February 1st through March 1st, 2018. The public is invited to an Opening Reception with live music and refreshments on February 11, 2018 from 1 pm to 4 pm. The Arts Center is located in the Hill High Orchards complex on Route 7, west of Round Hill. 1. Artists must register by submitting an entry form by January 9, 2018 and paying the $5 entry fee (waived for students). 2. Artwork must be delivered to the Round Hill Arts Center on Tuesday, January 23rd between 10am and 4pm. If you need to deliver work at another time, please contact the Center Manager. We reserve the right to refuse any artwork for safety or space reasons. Please bring 2-D work framed and ready to hang. We do have limited space for 3-D work — please let the Center Managerknow your space requirements, or if you have any questions. 4. The Show will open on February 1st, with an Artists’ Reception from 1 pm to 4 pm on February 11th, and will run until March 1st. The show can be viewed daily between 12 pm and 4 pm. 5. Please pick up your work on Friday, March 2, between 9 am and 4 m, or contact the Center Manager for other arrangements. Round Hill is perfectly located between two Appalachian Trail visitor centers. Bears Den is located five miles to the west and the Blackburn Center is located five miles to the north. If a visitor wanted to visit both places on the same day, they would have to drive through Round Hill’s Central Commercial District. Bears Den provides a gateway connecting people to the infamous “roller coaster” section of the Appalachian Trail. Bears Den Lodge and Hostel is located in a historic stone mansion, on 66 acres of land, 150 yards from the Appalachian Trail. At 1,350 feet, the Bears Den Rocks provide a panoramic view of the Shenandoah Valley and the Blue Ridge Mountains. The westward-looking view provides a prime spot for the sunset. In 2014, about 1,900 people visited Bears Den. The Blackburn Center is primarily designed to support: long distance hikers, trail crews, Potomac Appalachian Trail Club planning meetings, and training seminars. It is also used as a venue for special events such as weddings. Located on 150-acres of land and backing up to the Appalachian Trail, the Blackburn Center can accommodate up to 80 plus people for a day event and has indoor lodging space for 30 people with at least 30 more using tent spaces and the adjoining campground. In 2014, about 1,000 people visited the Blackburn Center. Visitors include: day hikers, thru hikers, section hikers, boy scouts, girl scouts, and private groups. Round Hill considers the Appalachian Trail as one of its most unique assets and views the trail as an excellent opportunity to boost the local economy. The 2017 Comprehensive Plan set forth the goal to promote environmental stewardship as a mechanism to increase community viability, economic health, and sense of place in Round Hill. The Town Council wants to increase connections between Round Hill and the Appalachian Trail to promote community awareness and increase knowledge of the trail as a local asset. The following is the Town of Round Hill’s Strategy to become a member of the Appalachian Trail Community™ national designation network. Establish a Round Hill Appalachian Trail Advisory Committee made up of local Appalachian Trail volunteers and supporters. Include the Appalachian Trail in Town marketing and provide educational materials at the Town Office. Increase dialogue with county officials about the importance of the Appalachian Trail to Round Hill. Encourage local residents to volunteer at the Bears Den and Blackburn Trail Centers. Educate residents on the benefits of membership in the Potomac Appalachian Trail Club and Appalachian Trail Conservancy. The Appalachian Trail Community™ program is designed to recognize communities that promote and protect the Appalachian Trail (A.T.). Towns along the A.T.’s corridor are considered assets by all that use the A.T., and many of these towns act as good friends and neighbors to the Trail. The program serves to assist communities with sustainable economic development through tourism and outdoor recreation while preserving and protecting the A.T. The Town has held 4 meetings with the new Round Hill Appalachian Trail Committee. This Committee will work together to submit the application to become an Appalachian Trail Community and develop future A.T. programs/projects. The application to become an Appalachian Trail Community is due August 30, 2018. The Round Hill Appalachian Trail Committee plans to submit their final draft of their application to the Town Council by June 1, 2018 for their approval and resolution of support. The next Appalachian Trail Committee Meeting is November 28, 2017 at 6:30 pm at 23 Main Street (Town Office).